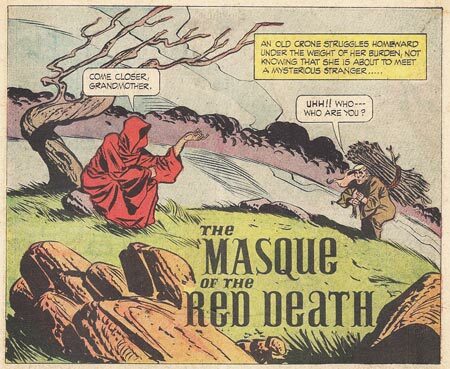 There was a day that was unusually vivid for me, and though I talk about it on my comics page, I thought I'd go into more detail and offer up a few images from the original 1964 Dell comic "Masque of the Red Death". I've often pondered the complexity of memory, and why some events - no matter how trivial - ring bells louder than others. I still wonder why these memories linger within me for so long. I'm happy they do, and this is one of them. On the day that I bought this comic, the weather was warm, and unusually gray for August. It was extremely dreary and not like summer at all. In the Pacific Northwest, a long string of beautiful summer days can be abruptly interrupted with a balmy gray shroud that covers everything. These days usually come without warning. Typically for this type of summer weather, there was no wind, just heat and grisly gray. Naturally, it seemed eerily apropos that I bought this particular comic. When I made the trek to our local Food Fair store I had no idea what I was going to get, I just had some change burning a hole in my pocket. The neighborhood was unusually quiet; perhaps the local kids thought nobody would be out playing so they stayed inside to watch TV. Food Fair had an old wooden screen door that slapped shut behind me as I entered. A bell jingled announcing my presence. The spring on the door made a yawning creak when opened just like the screen door on our house. This was always one of my favorite stores and I always looked for a reason to go there. At the time, I enjoyed its bucolic ambiance and outdoor fruit and vegetable market. Their selection of goods was really quite diverse and they even had a small toy section. I entered the store that morning, and my eyes were immediately drawn to the comic book rack. There, on the metal spindle, was a comic that captivated me completely. 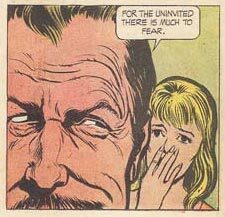 While I stood in the store, among the lavish scent of malt balls and red licorice, the creepy looking comic had stolen all of my attention. My mom, my brother Pat, and myself all went to stay overnight at my mom's best friend's house. Her name was Merle, and we'd known her and her family for many years. I was very close friends with her two daughters who were closest to my age. We played together quite well considering that our genders were separate. (Perhaps the boy-girl class struggle wasn't as much a class struggle as I thought it was). It was a long walk to Merle's house, perhaps a mile or more. I really wanted to read this comic, more than anything, but it would have to wait until we got there. I also knew there probably wouldn't be much time to read it with all the girls and the boys around to play with. Merle had three girls and two boys who were still at home. Her oldest son had grown and moved out, but he showed up for visits quite often. Upon our arrival, I found that most of the kids were gone. Pat chose to hang out with the older boys and they left me to my own devices. So, there I was, with my wonderful new comic, and lots of time to read it! Along the way we'd stopped at a store and mom bought me a box of Dots and some Good N' Plentys. For some odd reason, the flavor of the lime Dots really remind me of this day. I sat in their living room, seeing the weird gray skies out the window, and opened up my new comic for some enjoyable reading. I was fascinated by the characters in the "faceless robes". Their ghostly presence only added to the thrill of what lay ahead in the pages. I had no knowledge of Edgar Allan Poe then, and had no previous inkling of the tale of "The Masque of the Red Death" . The ghostly figures seemed so odd and haunting. Each page was a delight, and I was thrilled with the comic. What a marvelous investment of twelve cents it had been! Not only did I not know anything about Poe, I also didn't know that two separate stories had been interwoven in this story: "Masque of the Red Death" and "Hop Frog". The whole comic was such high entertainment that I longed to see the movie it was based on, but that never happened for me until much later in the early seventies. Date stamped in my memory is that particular day and the evening we spent there. Though I can't recall just where the girls were, or where the rest of the kids went that night. Perhaps they stayed over at friends' houses; I just recall being alone there. Later that night I stayed up until the late hours watching an old WWII movie where some soldier got ran over by a tank. (I would love to remember what movie this was). I'll always remember that comic book, the walk to the store to buy it, and the joy of reading it. Of note: I recently re-read this comic. Before I built this website, I purchased it from Ebay. I paid eight dollars and shipping, a far cry from its original twelve cent price. The one thing a person can't buy on Ebay are the memories and thrills of those first experiences; nothing captures them like memory.